The decision to either play sports professionally or join the workforce is one that every graduating student-athlete has to face. 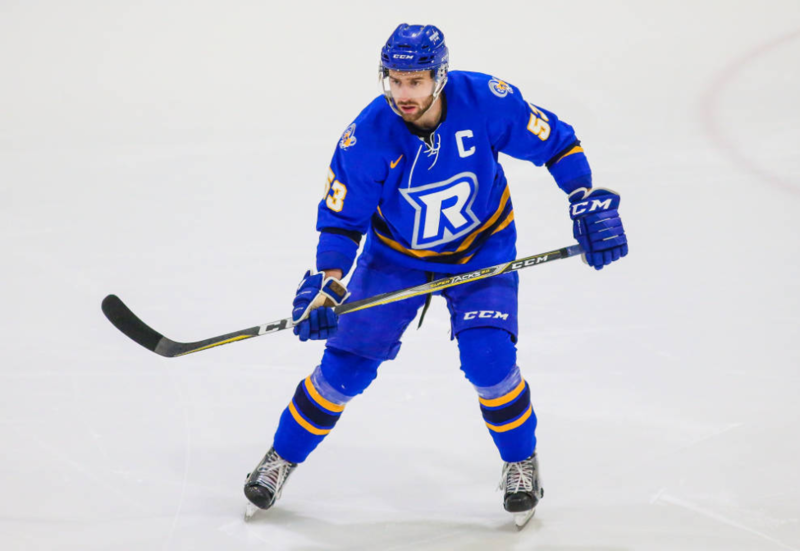 It’s a decision looming on Ryerson’s men’s hockey captain, Alex Basso. Basso decided to return to Ryerson after being accepted into the master of business administration program. The year-long program allowed Basso to play one more year of Ontario University Athletics hockey before reaching his five-year maximum. However, before deciding to return, Basso looked around for professional teams. The athlete said he did extensive research on different leagues in both Europe and North America. His decision to come back, he said, was best for his future in both business and hockey. “It was a tough decision that I needed to talk to a lot of people about,” said Basso. He has attended camp with the Washington Capitals and most recently, the New York Rangers. After his season ended, Basso was called about the Rangers rookie camp and spent a week in New York. He also attended a camp with the American Hockey League’s Toronto Marlies, whom he has been in touch with over the course of the past year. Basso isn’t the first Rams captain to have this dilemma. Kevin Krasnowski, a four-time team MVP from 2006 to 2009, also struggled between going professional or starting a working career. After graduating, Krasnowski was just months away from heading overseas to play in the United Kingdom’s Elite Ice Hockey League before changing his mind. “I had contemplated going to Europe and I had spoken to a couple of teams, but I played (an extra year) so I was almost 25 when I finished school,” said Krasnowski. After graduating university and playing competitive hockey his whole life, it was time for a change. Since graduating from Ryerson, Krasnowski has stayed involved in the sports industry, spending time at SCOREGolf magazine, TSN, and now owning One Ram Media. As for Basso, he’s keeping the option to play professionally in the future open, but he also realizes that’s not a guarantee. He’s being realistic with himself and taking it month by month to see where he ends up with hockey and school.